Coyer K, Dowmunt T, Fountain A. The Alternative Media Handbook. ew York: Routledge ; 2007. Coyer K. Mysteries of the black box unbound : an alternative history of radio. In: Coyer K, Dowmunt T, Fountain A, editors. The alternative media handbook. London: Routledge; 2007. p. 15-28. (Media practice). Coyer K. Access to broadcasting : radio. In: Coyer K, Dowmunt T, Fountain A, editors. 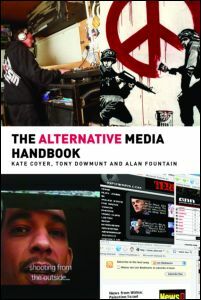 The alternative media handbook. London: Routledge; 2007. p. 112-23. (Media practice). Coyer K. A place where money grows on trees? In: Coyer K, Dowmunt T, Fountain A, editors. The alternative media handbook. London: Routledge; 2007. p. 315-8. (Media practice). Tridish P, Coyer K. Media reform activism in the US : the movement against consolidation of media ownership. In: Coyer K, Dowmunt T, Fountain A, editors. The alternative media handbook. London: Routledge; 2007. p. 248-50. (Media practice).